ahorasoyuncronopio: MT HOOD INC. What’s the Mountain Worth to You? 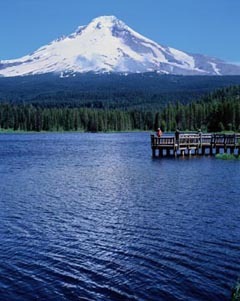 Mt Hood is one of Oregon’s most prominent icons. It’s the picturesque image you see beyond the skyline of Portland. It’s what you think of when planning winter or summer vacations, whether you ski, snowboard, mountain bike or fish. You know you’ve reached Oregon when you fly over it before landing at PDX. This is what Mt Hood might mean to visitors or other Oregonians. To us, it is so much more. It is our very livelihood. Last week, OPB launched a week-long series (June 10-17) that delves into the economy of Mt Hood and its many contributions to the state as a whole. Kicked off with a live broadcast of Think Out Loud from Timberline Lodge, the series takes an intriguing look at the value of Mt Hood in terms of jobs (a whopping 5300 which includes all forest, tourism, agriculture and timber jobs) products (besides wood and water, carbon! ), costs (to be reported on June 16) and as a brand (to be reported on June 17). Although looking at the mountain from a financial and economic standpoint is certainly relevant, what kind of impact does Mt Hood have on the people who live or visit here? We enjoyed reading the personal stories and comments after the Think Out Loud commentary, as well as the photo gallery and videos of people relating “What Mt Hood Means to Me”. What about you? Please share with us your insight, experience or history with majestic Mt Hood. What’s the mountain worth to you?